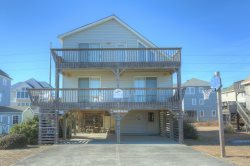 You don’t have to look far to find the ultimate relaxing OBX accommodations, thanks to this stellar 4 four bedroom vacation home that’s bursting with amenities. Reel Therapy is one of the select few vacation homes on the Outer Banks to feature the YMCA amenity package, which allows all guests the use of (for no additional charge)the outdoor water park, skate park, and full indoor gym with classes. For the off season there is an indoor pool to splash in, and in the in season free night of babysitting so you can enjoy the Outer Banks night life. The Passes will be provided at the YMCA visit after a form is submitted to use the facility for the week stay! The first thing you'll notice about Reel Therapy is the extensive decking that allows your entire family to enjoy the cool breezes and spectacular views of the Wright Brothers Monument. You not only have a view of the Monument, from the upper deck you can also enjoy a view of the ocean. Reel Therapy is centrally located in Kill Devil Hills, approximately 400 ft. from the beach, with direct beach access. This is a great family vacation home, featuring all the amenities to make your vacation special, but without the huge price tag. Here you will find a large 4 bedroom home, with enough flexibility to accommodate two families, along with 2 full baths and a half bath in the laundry area. Reel Therapy also has a lot of extras that are hard to find! You will find an extensive collection of DVD's, games and a few books for the bookworm in the family. Outside, your entire family will enjoy the hot tub on your deck. Sink in and say, "Ahhhhh!" as the warm water envelops you. Your favorite beverage will make a nice addition and don't forget to enjoy the night stars; they are so much brighter here that you could almost reach up and pluck one out! From the bubbly hot tub to the engaging YMCA package, Reel Therapy is the best cure for the vacation blues. Make your escape to this centrally located beach home, and see why a little Reel Therapy is all that’s needed for an exceptional time on the Outer Banks. My family and I enjoyed the stay! We made lots of memories that are priceless. The location was good, the decks were nice, lots of space. It accommodated 4 families. Very clean when we arrived. We appreciated that! convenient having a grill which we used! Overall it was a great stay, Thank you!!! The Masters ? ?